I can’t study at University; I’m too old, aren’t I? Considering University as a mature student? Worried about whether it is possible? This short guide will help alleviate common misconceptions. My name is Gemma and I was a mature student, following an Access Course. I am a mum of 1, I am 31 years old and I have worked for 12 years in Financial Services. The past 4 years has taught me that it is possible. You will have the time of your life; and whilst it is a big commitment, you will wonder why you didn’t do it years ago. I can’t go to University as I have young children. It’s easy to use children as an excuse to defer attending University. I did the opposite. Being on my own with a 15-month-old and leaving her at the nursery for 10 hours a day whilst I worked didn’t suit me. I saw an opportunity to study for a degree and spend more time with my daughter. She wasn’t a barrier to the higher education she was the stepping stone. I was surprised at the help on offer. The childcare grant through student finance meant that I was able to apply for 85% of my full-time childcare costs. Top tip: check out onsite University nurseries for very young children. The University of Worcester nursery allows you to book 3-hour-time slots rather than full days, fitting in really well with lecture timings and saving money. I can’t go to University because I can’t afford to. This is a common misconception. It is completely WRONG!! Mature students’ finance entitlement is calculated differently to those living with parents. Also, if you have caring responsibilities (e.g. children) you may qualify for extra grants and even help with costs such as books. Most universities also offer additional grants, scholarships and financial help for those in hardship. 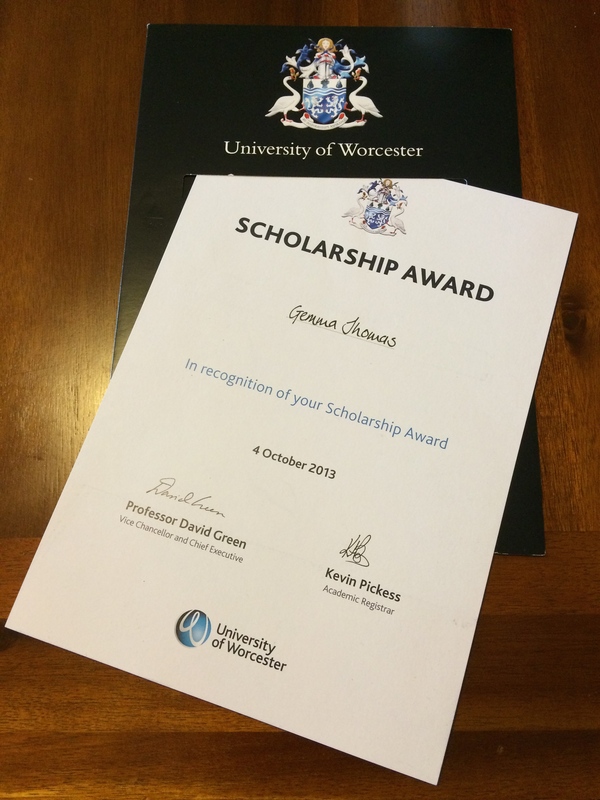 Whilst studying at the University of Worcester I qualified for a bursary each year, received a £1,000 award for academic achievement and also applied to the Access to Learning fund in my first year. With the extra help, I was better off than I imagined. I had to budget but with careful planning finances were manageable. Top Tip: Universities each have different bursary and scholarship schemes. Check out the different options and work out if your University choice will make a difference to your finances. I can’t go to University because I will have to give up my job. I made the choice to give up my full-time job to go to University, but you don’t have to. Many courses are offered on a part-time basis, meaning you can fit lectures around work. I chose to study full-time but still managed to work a few hours each week to top up the kitty. I worked part-time for the 2nd and 3rd years in a University paid placement which allowed flexible hours around my course and family. I gained great work experience which has helped when applying for jobs at the end of my course. I am now working full-time whilst completing my masters. Do what works best for you. Top tip: Every worker is now entitled to request a flexible working pattern. If you want to combine your existing job with the study, approach your employer and see what they say. I won’t enjoy University because I will be surrounded by people half my age. One of the reasons I felt so at home at the University of Worcester is the diversity in the student population. There were a lot of younger people. But there were also older students and lots of others similar in age and circumstance to me. The younger people made me feel young again but also looked to me for support and guidance. Having such a diverse range of people improved my experience at uni rather than hindered it. Top Tip: Don’t worry about having to party all night to make friends. Younger students also enjoy coffee and a chat as much as you may like the occasional night out. I can’t go to University because I didn’t do well at school. Just because you didn’t do well at school, it doesn’t mean you cannot go to University. As a mature student, there are other routes to entry. I began my University journey by attending a 9-month Access to Higher Education course. This gave me the entry qualifications required as well as preparing me for academic study after 12 years of working. Lots of courses at the University of Worcester also offer entry via Accreditation of Prior Learning (APL) which takes into account life experience and professional qualifications. Top Tip: Course prospectuses don’t always highlight alternative entry routes to A-levels, but most do accept students from other backgrounds. I searched the Uni website and made direct contact with the course leader who invited me in for the interview. I’m too old to go to University; I should be concentrating on my family. You are never too old to go to University. By pursuing your dreams and gaining a University education, you will inspire your family to do the same. Your family and children, if you have them, will benefit in the longer term as you are likely to be happier, healthier and better paid than non-graduates. I found that I was able to spend more time with my family when at University as although it was a full-time course the contact hours were 12 per week. I opted to do a lot of study in the evenings when the children were sleeping meaning they had more time with me than ever! 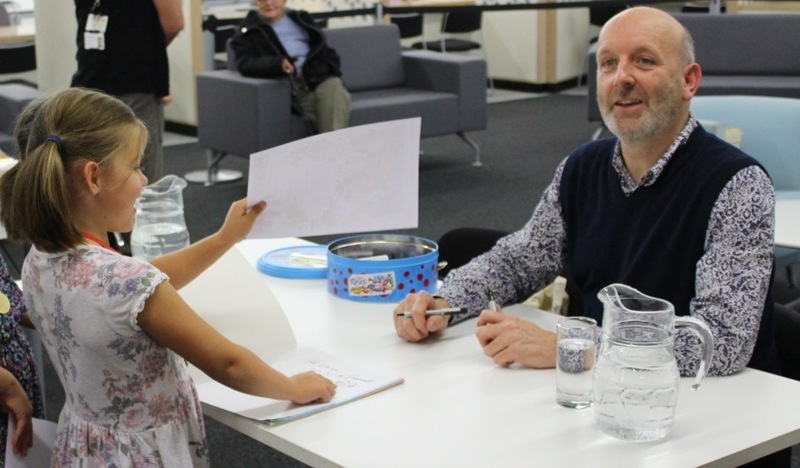 Recently, I took my daughter to Beeline Festival to meet Nick Sharratt, she loved it!!! Top Tip: Talk about your aspirations with your family and children. I even took my daughter along to a lecture. Now she talks about when she will go to Uni. I haven’t written academically for years; I wouldn’t know how to start an essay. You will be surprised at how quickly you pick this up. If you go through the Access route you will be fully prepared. If not, don’t PANIC!! The University of Worcester have a programme of study skills workshops and can offer individual appointments to help improve your skills. Top Tip: Ask for help if you need it. There is support available, but you have to make the first move. I have too many demands on my time, I don’t know how I will fit it all in. As a parent you will already be a dab hand at juggling your time. With careful planning and scheduling time in each week for study you will cope better than many with the demands of study and family life. This doesn’t mean to say you won’t be running to nursery or school, eating breakfast en route, whilst trying to button up cardigans before tearing across town to a lecture. Most mornings were like a scene from wacky races when I was at Uni. That hasn’t changed now I am working again. Top Tip: If you qualify for a childcare grant and are studying full time you can claim up to 85% of your full-time childcare (even if your contact hours are only 12). This is a great help when assignments are due in. It’s never too late and you’re never too old to study at university! Even if you haven’t applied yet, you could still start your studies this September. There’s full listings of courses on the Universities website, which are available for you to browse through. You never know what may catch your eye, and with all the help and support you can ever need, you can go to university no matter how old you are! It’s never too late to start your university journey!